We close the month of November with the commemoration on the Irish calendars of a saint named Toman. The Martyrology of Donegal lists 'Toman, priest' at November 30 but somewhat confusingly, the Martyrology of Gorman refers to 'womanly Tommán', Toman bithea. The translator had similarly rendered a reference to an Ultan bithí on May 24 as 'womanly Ultan'. I am left wondering what is implied by this epithet, perhaps the saint is of a slender build or something like that. I could find no mention of him on the earlier Martyrology of Oengus. he was a fair diadem, noble ! 29. D. TERTIO KAL. DECEMBRIS. 29. BRENAINN, Abbot, of Biorra, A.D. 571. Birr, in the barony of Fercall. St. Brendan, senior, of " Biorra, or Birr," to distinguish him from Brendan, junior, of Clonfert, was the son of Luaisrene, and is stated to have been of an illustrious family of Munster. He is reckoned among the relatives of St. Erc, of Slane, and the descendant of prince Corb, who resided in the Decies. Clonard was the school in which he received his education, and among the principal disciples of St. Finnian he was highly esteemed for his sanctity and supernatural gifts as a prophet. He was intimate with the Kierans, Brendan of Clonfert, and chiefly with Columbkille, to whom he rendered an important service. St. Adamnan relates, that a certain synod, supposed to have been held in Geashill, in the King's county, had issued a sentence of excommunication, not a just one, however, against Columba, on account of some venial and excusable proceeding. On the arrival of Columba at the synod, Brendan, who saw him at a distance, rose up, saluted him with great respect, and embraced him. Some of the assistants or principals at the synod, taking Brendan apart, remonstrated with him for having shewn such attention to a person whom they had so severely censured. Brendan replied, " If you had seen what the Lord has been pleased to make manifest to me this day concerning this elect of his, whom you are dishonouring, you would never have passed that sentence: whereas the Lord does not in any manner excommunicate him in virtue of your wrong sentence, but rather exalts him still more and more." They, then asking how this could have been, were assured by Brendan, that he saw a luminous pillar advancing before this man of God, when on his way, and holy angels accompanying him through the plain. Therefore, added Brendan, I dare not treat with contempt, him whom I see preordained by God, as a guide of nations unto life. Upon which the whole proceedings were withdrawn, and the whole synod paid Columba the greatest respect and veneration. At what precise period St. Brendan founded the monastery of Birr is not recorded. It must have been founded before the year 563, that in which St. Columba repaired to the north of Scotland. Brendan died on the 29th of November, A.D. 571. The exit of Brendan to the other life was revealed to St. Columba, then in Hy, the very moment it happened. In one of the lives of Columba it is said, that Brendan had composed some verses concerning the virtues and exemplary conduct of St. Columba, who was much esteemed by the abbot of Birr. Rev Thomas Walsh and D P Coyningham, Ecclesiastical History of Ireland (New York, 1898) 502-503. St. Brendan of Birr, is to be carefully distinguished from his more celebrated namesake of Clonfert. He is sometimes called Brendan the Elder—Brendanus Senior—and like Brendan of Clonfert, came of the race of Fergus MacRoy, which produced more saints and heroes than, perhaps, any of the other Celtic tribes. The two Brendans were together at Clonard under St. Finnian, and both are ranked amongst the Twelve Apostles of Erin. 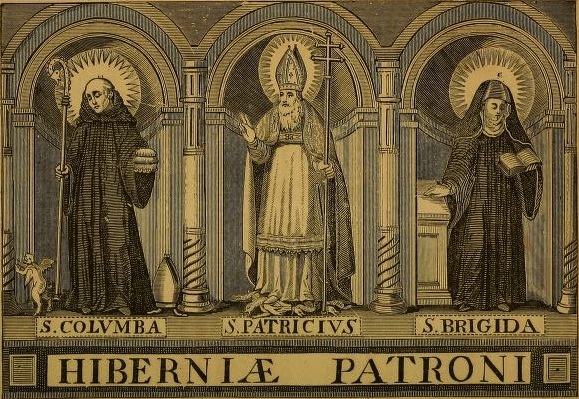 St. Brendan of Birr was especially remarkable for the fulness of the prophetic spirit which he possessed; and, according to one account, it was in obedience to his counsel that St. Columba, after the battle of Cuil-Dreimhne, resolved to leave Ireland, and preach the Gospel in Alba. It is said that on the same occasion he befriended Columcille at a Synod held near Teltown in Meath, where an attempt was made by some of the 'saints' to excommunicate Columba for his alleged share in bringing about that bloody conflict. It is certain that Brendan was highly esteemed by all his contemporaries, and when he founded his monastery at Biorra, or Riverstown, as it would be called in English, it soon grew to be a very celebrated institution. The Four Masters, at A.D. 553, tell us that 'Brendan of Birr was seen ascending a chariot into the sky this year.' This entry is not intended to signify that he died, but rather that, like St. Paul, he was taken up to heaven for a little, for his death is noticed by the same Four Masters, under date of the year A.D. 571, when they tell us that he died on the 29th of November. The real date appears to have been A.D. 573. Insula Sanctorum et Doctorum or Ireland's Ancient Schools and Scholars by the Most Rev. John Healy (6th edition, Dublin, 1912), 522-523. Bochra's (three) sons perennial triumph! sons of Bochrae, i.e. three brothers from Achad rathin in the Dési of Munster. Bochrae was their mother's name. Laidgenn and Caindech and Aed-cobran their names. The soldiers have been magnified: Bochra's three warlike sons. i.e. Laidcenn, Cainnech and Accobran, from Achad Rathin in Húi meic Caille in Dési of Munster. Bochra is their mother's name. (1). Bochra was the mother of the three sons of Fidlin, viz. Laidcend, and Cainnech, and Aedchobran. (2). Bochra was the mother of the three sons of Irlamain, viz. Fidlin, and Liadnain, and Dulechain. The Book of Ballymote and Book of Lecan agree with the Book of Leinster as to (2) ; but in (1) they read "Bochra was the mother of the three sons of Bochra," the names of the sons being the same. Laidhgenn, Cainneach, and Accobran, the three sons of Bochra, are commemorated on November 28, in the Martyrologies of Donegal and Tallaght, and by Marianus Gorman. In the Felire, "the sons of Bochra" are celebrated in the text on that day, while the Commentator in the Lebar Breac gives their names as above. They are described as "of Achad Raithin in Ui-mic-Caille in Deisi Mumhan." Rt.Rev. Dr. Graves, On an Ogham Monument Recently Found in County Kerry in PRIA. 3rd ser: v.3 (1893), 374-379. Achebran is presumedly the Irish Aed Cobhran, one of the sons of Bochra; and his brothers were Laidcenn and Cainrech. Bochra was the name of the mother. Their father's name is unknown. The three brothers were commemorated as Saints of Achad Raithin in Ily MacGaille, in Waterford. But Aed Cobhran had a special commemoration on January 28, as having a cell under Inis Cathy. He was consequently associated with S. Senan, if he belonged to the period. His cell was not in the island of Inis Cathy, but at Kilrush on the mainland, in Clare. He is there forgotten; there are two old churches in the place, but both are named after S. Senan. This is due to Aed Cobhran not having founded his church, but to his having occupied one belonging to S. Senan. ..The day of Aed Cobhran, as already said, in the Irish Martyrologies, is January 28, but he is also commemorated along with his brothers on November 28. In that of Donegal he is mentioned as of Cill-Ruis or Kilrush, in the county of Clare, but he is no longer there remembered. Cill-Ruis was in the diocese of Iniscathy, which seems to indicate, as already mentioned, that he was a disciple of S. Senan, who is the Cornish Sennen. He is commemorated in the Felire of Aengus, and in the Martyrology of Tallagh as well. S. Baring-Gould and J. Fisher, The Lives of the British Saints: the Saints of Wales and Cornwall and such Irish saints as have dedications in Britain in four volumes. Vol. I. (London, 1907), 106-7. Achevran or Achovran (modern Keverne), a male saint, since at least 1086 and probably since at least the 10th century as he occurs in the early list of Cornish saints. He was probably in origin an independent figure, but by 1266 he was equated with the Irish saint Ciarán of Saighir, and by the 15th both were identified also with Piran. Nicholas Orme, English Church Dedications with a Survey of Cornwall and Devon (Exeter, 1996), 94. I don't think therefore that we can put much trust in Baring-Gould's thesis that Saint Acobran of Kilrush is to be equated with Acobran, one of the three sons of Bochra and with the Cornish saint Keverne. I haven't been able to discover any further information on him or his brother saints. Secundinus is a well known Late Latin name, a derivative of Secundus ... Several known fifth-century bishops bore the name and in Gaul it continued to be used into the seventh century when we find bishops of Lyon and Sisteron called Secundinus. St Sechnall is known as the patron of Dunshaughlin in Co. Meath, a short distance from Tara. His cult seems to have been attested from as early as appropriate sources are available: his feast day is 27 November. ...compound personal names embodying the saint's name were created in the central middle ages. D.N. Dumville (ed. ), Saint Patrick A.D. 493-1993 (Boydell Press, 1993), 99-100. 27. Sechnall, i.e. from Domnach Sechnall in the south of Bregia. the praise of Patrick of Armagh. i.e. a son of Patrick's sister, i.e. from Domnach Sechnaill in Fir Breg, and of the Lombards of Italy was he. He was sprung from Lombardy, and there his name was Secundinus. 27. B. QUINTO KAL. DECEMBRIS. 27. SEACHNALL, i.e., Secundinus, Primate of Ard-Macha. He was the son of Liamhain, sister of Patrick ; and at Domnach Sechnaill, in Bregia, his church is. The Life of Patrick states, book 2, chap. 25, 3 that Patrick erected a church at the place where Secundinus used to pray alone under a leafy tree, and that the sign of the cross is in that place, i.e., at Topar Mucna, in Connacht, as is understood from the Acts of Patrick. A very ancient old-vellum-book, spoken of at Brighit, 1st of February, and at Patrick, 17th of March, states, that Bishop Sechnall had a similarity in morals and life to Hilarius, bishop and sage. The first notice of Dunshaughlin which occurs in our annals a very remarkable one indeed is its connection with St. Seachnall. In fact it owes its origin to this saint, and derives its name from him "Domhnach (Dominica) and Seachnall or Seachlann" - St. Seachnall's Church. St. Seachnall or Secundius was a native of Gall, and son of Restitutus, a Lombard, by, it is said, Liemania, otherwise named Darerca, who is usually said to have been sister to St. Patrick. According to Tirechan's list, Secundinus and Auxilius, his brother, were disciples of St. Patrick, and seem to have accompanied him from the commencement of his mission to Ireland. After a few years they were sent to Britain or Gaul to be consecrated, as, according to the established usage of the Church, three bishops are required for the consecration of another. The Annals of Ulster and Innisfallen remark, at A.D. 439, that the Bishops Secundinus, Auxilius, and Isserninus, were sent this year to aid St. Patrick. St. Seachnall fixed his see at Dunshaughlin, and was reputed a very wise, prudent, and holy man. In the Four Masters he is called "St. Patrick's bishop without fault". So high was the opinion St. Patrick had of him that when he went to preach the Gospel in Leinster and Munster, he appointed St. Seachnall to preside over the converts of Meath and the North. Hence he is called St. Patrick's vicar or suffragan. It is recorded that on one occasion he expressed disapprobation at St. Patrick's extreme disinterestedness in refusing presents from the wealthy, by means of which he could support the religious converts who might be in distress. On St. Patrick explaining his reasons St. Seachnall asked forgiveness, and composed a hymn in his honour which, most probably, was the first Christian Latin hymn composed in Ireland. It has been published by Father Colgan, and republished by Ware, who calls it an alphabetical hymn, because the strophes, consisting each of four lines, begin with the letters of the alphabet, following in order. It appears too in the ancient Antiphonarium Benchorense, a work certainly beyond one thousand years old, which has been republished by Muratori. There are different readings in the various editions, but substantially the same. St. Seachnall's hymn is frequently referred to in our ancient writers, and many favours are promised to those who reverently recite it. After a holy and edifying life, his suffraganship having lasted for six years, St. Seachnall died on the 27th of November, 448, in the seventy-fifth year of his age, and was interred in his own church of Dunshaughlin. He was the first bishop who died in Ireland, and has been held in special reverence throughout the diocese of Meath. As an instance of this, the name Maol-Seachlan (servant of St. Seachnall) was common amongst the ancient Irish (but particularly in the royal race of Meath. The O'Maolseachlains, or O'Melaghlins, who belonged to the great branch of the Southern Hy-Nialls or Clan Colman, took their name from their ancestor Maolseachlain (Latinised Malachias and Anglicised Maiachy), who again took his name from the first Bishop of Dunshaughlin. This name O'Maelseachlain has been Anglicised MacLoughlin since the reign of Queen Anne. Rev. A. Cogan, The Diocese of Meath Ancient and Modern. Vol. I. (Dublin and London, 1862), 55-57. 'Banbán, i.e. bishop of Lethglenn'. 'bishop of Lethglenn: of the Corco-Duibni was he'. 26. A. SEXTO KAL. DECEMBRIS. 26. BANBHAN, Bishop, of Lethghlinn. He was of the Corca Duibhne. The Felire of Oengus at 26 November mentions a Banbán, Bishop of Leighlin, of the Corco-Duibhne, who is not noticed in Ware’s list of the bishops of that diocese. and warns that our saint of 26 November should not be confounded with another saint of the same name who is known as 'Banbán the Wise' and whose feastday is given in the Martyrology of Donegal on May 9. He died, according to the Annals, in the year 720. W. M. Hennessy, ed. and trans., The Annals of Ulster - A Chronicle of Irish Affairs from A.D. 431 to A.D. 1540, Volume 1 (Dublin, 1887), 176-177. BANBHAN or Banvan, bishop of Leighlin about whom nothing else is known. His name is interesting as it might be an indication that he was the first native Irish bishop in that area, Banba being a name for Ireland. E. Neeson, The Book of Irish Saints (Cork, 1967), 206-207. I'm not sure what to make of that curious suggestion. I agree that the name is interesting, but the existence of Banbán the Wise shows that it is not unique. The founding Bishop of the see of Leighlin is held to be the 6th/7th-century Saint Laserian or Molaise, whose feastday is commemorated on April 18. He, however, found a monastery already established at the site by Saint Gobban, who relinquished the abbacy to Laserian in fulfilment of a heavenly vision of a coming saintly stranger who would gather together in that place as many servants of God as there were angels in the heavenly host. Dr Comerford's history reconstructs the list of successors to Saint Laserian only from the year 725 and does not mention our saint Banbán among them. Perhaps it is possible that he was one of the earlier abbot/bishops and flourished sometime in the period between the death of Saint Laserian in 639 and the death of Saint Manchen of Leighlin in 725, the first of the founder's successors recorded by the Irish Annals. 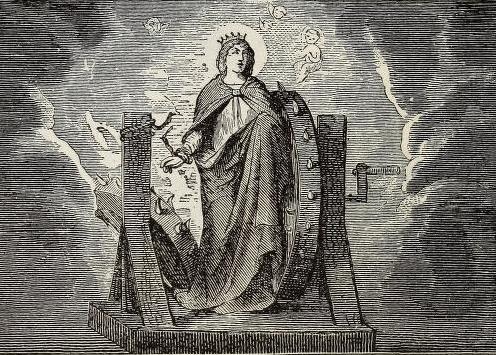 November 25 is the feastday of a saint much-loved in the East - Catherine of Alexandria. In common with other eastern martyrs, like Saints George and Margaret of Antioch, her cult flourished in the medieval West and accounts of her martyrdom appear in a number of European versions, including a fifteenth-century Irish one. I was particularly pleased whilst visiting the National Museum in Dublin to see a figure of Saint Catherine, complete with her wheel, in the company of our native saints on one of the reliquaries. In the medieval Irish poem, Réalta an chruinne Caitir Fhíona, they join her as well. Below is a translation by Father Lambert McKenna, published as part of a series on bardic poetry in the Irish Jesuit periodical, Studies. I think it is a beautiful tribute to the great martyr and I love its presentation of our native saints as exemplars of the same holy virginity that Saint Catherine embodied. 1. Star of the world, Catherine, helper of the Greeks; she succours most of the races of every province there against death. 2. Catherine curly-haired maid, branch of victory; face as the bloom of fresh apple-tree; bright brow. 3. Bright brow has she, daughter of the King of the Greeks, who never accepted suitor; in the hue of her cheeks is the sheen and colour of the berry. 4. The berry's colour and summer sunshine is in her ruddy cheek; many the curl bending from its stem in her coifed hair. 5. In the shape of Catherine's round eyes no Grecian woman surpassed her; round eye that gazed on no young warrior; lips deep-red and white. 6. Face as apple-blossom; bosom as swan; maid inviolate; down is not whiter than her gleaming white hand; grey eye in fair cheek. 7. No maiden do I see like her in charm but I entreat her; may Mary's Son hide away my folly. 9. Athrachta succour of the Luighnigh; great her zeal; she is the fair-footed virgin of the Búill; waxen candle. 10. Bright gentle Ciarán, Colum Cille - gentle the company! - Pádraig, Martain, Mongan, Manann, Comann, Coireall. 11. The Trinity, great Mary and Michael, the host of the sun, (and) eleven thousand virgins of the Búill, flower of fair maids. 9. Athracta of Cell Sáile in Críoch Conaill; but she is here connected with Luighne, Co. Sligo. 10. Mongan, Martyr Oeng., Sept. 3; Manann, Martyr Don., Feb. 23; Caireall, ibid, June 13; several saints named Comman occur in the Martyrologies. Lambert McKenna, ed. and trans., 'Some Irish Bardic Poems XV. St. Catherine of Alexandria' in Studies: An Irish Quarterly Review, Vol. 19, No. 75 (Sep., 1930), pp. 439-440. November 24 is the commemoration of a poet-saint, Colman of Cloyne. Below is a short account of his life taken from the Moran revision of Archdall's famous text on the monasteries of Ireland, the Monasticon Hibernicum, serialized in the Irish Ecclesiastical Record. The fair-sided Land of Promise." At the request of St. Ita, St. Brendan, on a certain occasion, went forward to meet the youthful Colman, and admonished him to enter on a life of penance, saying " God has called thee to salvation, and thou shalt be as an innocent dove in the sight of God." Colman, throughout the remainder of his life, was docile to the inspirations of grace, and became illustrious among the saints of Ireland by his learning and virtues. Towards the close of his earthly pilgrimage, hearing of the fame of the school of Lough Eirce, he wished, though himself a master in the paths of perfection, to visit that monastery, and to enrol his name among the disciples of St. Finbarr. Our annalists do not mark with precision the year in which St. Colman founded the Monastery of Cloyne. It was certainly not before the year 550, for it is recorded that, at the inauguration of Aodh Caomh, King of Cashel, about that time, our saint took part as the royal minstrel of Munster. There seems, however, no ground for doubting the acccuracy of the statement made by O'Halloran in his History of Ireland (vol. 3rd, page 76) on the authority of the Psalter of Cashel that Eochaidh, Monarch of Ireland in the year 560, founded the Church of Cloyne for St. Colman. A beautiful ear of our wheat. "This Colman, the son of Lenin, was for learning and a holy life chief among the saints. He founded the Church of Cloyne, which is at this day a cathedral, and famous throughout the province of Munster." and of Roinne, smooth and gracious. The name of Roinne does not occur on the Martyrology of Oengus at this date and I cannot find any further references to the saint. The Martyrology of Donegal for November 21 contains the entry 'COLUMBAN, Abbot, who was in Italy'. This terse phrase does not allude to the richness and complexity of the career one of Ireland's greatest missionary saints and scholars - Columbanus (Columban), an alumnus of the monastic school at Bangor and founder of the great Italian monastery of Bobbio. Saint Columbanus was a forceful character whose rather fiercesome reputation preceeded him, but as a missionary and monastic founder he is among the most notable saints we have ever produced. Below is the transcript of a 19th-century lecture on the life of this compelling and fascinating saint. The lecturer, whom I think was Cardinal Moran, proudly presents a vision of Ireland as a beacon of light in a Europe darkened by barbarism and Arianism. Along the way he will introduce us to many of the personalities and issues of the saint's times. A PAPER READ BEFORE THE LITERARY AND HISTORICAL SOCIETY OF THE CATHOLIC UNIVERSITY, DUBLIN, JUNE, 1869. IT is related in the life of our great apostle, St. Patrick, that towards the close of his earthly pilgrimage, having prayed to God that the fruit of his missionary toil might be made known to him, he was conducted in spirit to the summit of a high mountain, whence he could survey the whole island, and he saw its hills and its valleys, its glens, its streams, its lakes, all glowing with the sacred fire of divine faith. Such, indeed, was Ireland in the sixth and seventh centuries this golden era of piety and learning in our island. Providence, in its own mysterious ways, seemed thus to prepare a home for religion and civilization, as they were gradually driven from the other nations of the West. The Roman provinces had become a prey to Barbarian hordes, and the tempest of destruction had slowly, but surely, gathered around the seven-hilled city. Ireland, however, protected by her insular position, felt not the fierce shock of these invasions, and her sanctuaries, monasteries, and schools, illumined with that heavenly light which St. Patrick had borne to our shores, presented a calm and befitting retreat for the proscribed civilization of Europe. Whilst thus the sanctity of her sons earned for Ireland the proud title of "Island of Saints," she trained up missionary bands to win back the lost kingdoms of Europe to the church's fold new soldiers of Christ, who were to subdue by the cross those very barbarians who now spread terror throughout Christendom. Well, indeed, does our native chronicler Marianus Scotus, write, under the year 589 : " Ireland, the island of saints, now exceedingly rejoiced in the number of her saints and miracles." Eminent among these great saints, and foremost in the ranks of Ireland's missionaries, was St. Columban. Closely allied with the family that gave birth to our great national patroness, St. Brigid, he was born about the year 430 in some district of West Leinster. Whilst in his mother's womb, the pious matron beheld in vision a bright star to arise from her bosom. Its brilliancy dimmed all earthly light, and its cheering rays filled the whole world. Thus was foreshadowed the future exalted sanctity of St. Columban, and the beneficent influence of his virtues and zeal, which should one day be a source of joy to many nations. We shall not dwell on his early youth, and the many combats which he sustained to enter on the rugged path. In the monastery of Cluaninis he cultivated with care the various branches of literature till his thirtieth year. Beautiful is the scenery, and many are the choicest gifts of nature that are scattered with rich profusion through the fair islands of Lough Erne, but far more rich are they in the hallowed memories which they bear once studded with the cells of those whose lives were devoted to virtue, and whose thoughts were fixed on heaven. Here, under the guidance of St. Sinell, every branch of science was carefully explored by Columban. His biographer makes mention of his study of grammar, rhetoric, geometry, poetry, and the Sacred Scriptures. His works, moreover, attest his acquaintance not only with the Latin but also with the Greek and Hebrew tongues, and his poems, commentaries, instructions, and letters, which have happily been preserved, still breathe the purest aroma of the classic age. Having attained the age for priesthood, St. Columban proceeded to the monastery of Bangor. In this "Valley of Angels," vallis Angelorum, as it was popularly called in our early Church, the sanctity of St. Comgall renewed the glories of Lerins,and thousands of fervent disciples, under his guidance, pursued the paths of perfection. " Holy is the rule of Bangor," (thus, in the seventh century, one of its own sons chaunted the praises of this monastery) " it is noble, just, and admirable. Blessed is its community founded on unerring faith graced with the hope of salvation perfect in charity. A ship that never is submerged though beaten by the waves.. A house full of delights founded upon a rock. . . Truly an enduring city strong and fortified. . . The ark shaded by the cherubim on all sides overlaid with gold. . A princess meet for Christ clad in the sun's light. . A truly regal hall adorned with various gems. . A virgin most fruitful a mother also chaste. . . For whom a happy life is laid up with the perfect prepared by God the Father." A few facts will suffice to illustrate the spirit that pervaded the great monastery at the period of which we treat. St. Molua, when a youth tending his father's flocks, felt an eager desire to devote himself to science, and he sought to join the community of St. Comgall, the better to attain that end. His desire was revealed to the holy abbot, who, seeking out the little shepherd, asked him was he not afraid that the pursuit of learning would expose him to many dangers, and perhaps even turn him away from God. Molua replied, " If I attain true knowledge I shall never offend God : for they who offend him are they who know him not." St. Comgall at once conducted him to the monastery, saying to him, " Thou art firm in the faith, my son, true knowledge will guide thee in the road to heaven." Of another monk of Bangor named Dagan, cotemporary with St. Columban, it is recorded that he passed his nights in transcribing manuscripts, and his days in reading and carving in iron and copper. So devoted was he to labour that he is said to have constructed three hundred bells and croziers, and to have transcribed three hundred copies of the Gospels. One day, as he gave an exhortation to the religious, he said to them, " I thank my God that he has made me recognize among you the three orders of perfect religious life : those who are angels for purity, those who are apostles for activity, and those who are martyrs in desire, being ready, were it needed, to shed their blood for Christ." For several years St. Columban enjoyed a calm retreat within the hallowed walls of Bangor, and satiated his mind at the pure springs of true knowledge. Another thought, however, now engaged his soul, another desire was fixed in his inmost heart ; he yearned to carry the light and life of heavenly truth to remote nations who were seated in the shadow of death to check by the cross of Christ that barbarism which was quickly bearing away the vestiges of civilization throughout the Continent, and to re-produce in the distant desert lands the bloom and the fragrance of Bangor. Having received his abbot's blessing, Columban, accompanied by twelve companions, set out on his holy enterprise. The chronicler of his life records that on his way he visited Britain, but no details of this visit have been preserved to us. It may have been that he wished to receive the blessing of his great namesake, St. Columbkille, whose cell on Iona was rapidly becoming the metropolis of faith for the Picts and Britons ; or, perhaps, he desired to visit the tomb of St. David, that illustrious Cambro-Irish saint who, famed for miracles and sanctity, had, only a few years before, closed his earthly pilgrimage in his loved monastery of Menevia, which stood at the southern extremity of Wales facing Ireland, and whither Irish and Britons now flocked alike to pay the tribute of their homage, and to earn his patronage. It was about the year 575 that St. Columban and his companions landed on the northern shores of Gaul. For some months they strayed along the banks of the river Somme ; but everywhere received insults and injuries from the inhabitants. At length a rich nobleman named Riquier welcomed them into his house : and, in reward for his hospitality, he was soon inspired with an eager desire to practise the Christian virtues. In after years he himself joined the ranks of St. Columban, and devoted his life to the conversion of those who had rejected the preaching of his Irish guests. Such was his courage that he did not fear even to reproach the king and his courtiers for their irregularities. The king, far from being offended, sent to him a large donation, requesting that a special light should be kept burning before the altar as a token of the spiritual light with which the intrepid missionary had enriched his soul. But to return to St. Columban, the fame of the Celtic travellers soon reached the Court of Sigebert. Being summoned before the king, Columban declared, in the name of his companions, that they had not left their country in search of any earthly wealth, but only that they might follow Christ and bear His cross. Sigebert assured them of his favour, and told them they would easily find some solitary spot within his kingdom where they might devote themselves to their practices of piety; one only condition he required from them that they should on no account leave Gaul, nor think of converting other nations till they had first preached the glad tidings of salvation to the Franks. Columban journeyed on towards the frontier; but before we trace with him the foundations of his religious home, we may pause for a moment to consider the state of Gaul at the period of which we treat. Someone may perhaps imagine that there was but little work in France for the missionary zeal of a new Apostle. It is, indeed, the boast of that Catholic land, that from the day when Clovis with his three thousand warriors was vanquished by the prayers of Clotilde, and received the waters of baptism at the hands of St. Remi, the cross of Christ has ever been emblazoned on its banners. Others might be disposed to rush to the opposite extreme, and there are modern historians who assert that when St. Columban set out on his work of evangelization, the Sun of Faith had set on Gaul, and its people were once more plunged into the depths of Paganism. Both these extreme views are alike exaggerated. There were many holy men in France when St. Columban entered on his mission there. St. Germain ruled the church of Paris, and by his devoted charity and his paternal guardianship of the poor, became one of the most popular saints in the traditions of Gaul. St. Gregory, of Tours, fearlessly fed the flock of Christ in that city; and many other honoured names are registered in the annals of the French church, of bishops and holy men who zealously laboured in the cause of religion, and braved every peril to trim the lamp of faith, and preserve for their country the traditions of holy church. Still there was work for our Celtic Apostle. Even before the hardy Franks had issued from the German forests, the constant irruptions of barbarians had well nigh severed every social bond in Gaul, and the writers of the age attest that the civilization, not only of the old Celtic inhabitants, but also of the Roman settlers, was well nigh wholly decayed. Thus, the Frank tribes, after gaining an easy victory on the battle-field, came in contact with a corrupt civilization, which, instead of reclaiming, served only to intensify their barbarism, and to raise new barriers against the cross of Christ. As the inhabitants had long ceased to cultivate their lands, whole fertile provinces had become desert wastes ; a wild vegetation covered the open fields with copsewood, and transformed the richest valleys into vast impenetrable forests. In one corner, alone, of Burgundy, there were reckoned, in the middle of the sixth century, no fewer than six forests. Towards the northern frontiers of Gaul, the wooded country was yet more extensive, and even in the provinces least depopulated, long lines of brushwood extended from forest to forest, enveloping all Gaul in one vast network of shade and silence. It was vain to hope that the ruling powers in Gaul would reflect some cheering ray on this dismal scene. On the death of Clothaire, in 561, his vast kingdom was divided between his three sons. To Sigebert, the bravest, was allotted Austrasia, which extended from the banks of the Somme to the Vosges, and thence, stretching along the banks of the Rhine comprised within its rule the North-eastern provinces of Switzerland. This prince, by his valour, advanced his frontier even to the banks of the Danube, made the Saxons his tributaries, and drove the Lombard hordes into Italy. The Arian King of the Spanish Goths, filled with admiration for such valour, gave to Sigebert his daughter Brunehaut in marriage. Brunehaut became a Catholic to please her new subjects, and for some years she was extolled throughout all Gaul, not only for her surpassing beauty, but still more for her piety, prudence, and moderation. Gontran, to whom posterity has given the epithet of " the devout," received the kingdom of the Bourgignons, or Burgundy, for his portion. The Vosges, with its mountains and forests, formed its northern frontier, and thence it stretched towards the south, along the rich valleys of the Rhone. Chilperic, the most wicked and most unfortunate of the sons of Clothaire, became king of Neustria, and fixed his capital at Soissons. He divorced his lawful wife in order to espouse the sister of Brunehaut ; but soon the Spanish dame had reason to look back with regret towards the sunny plains of her native land. By order of her husband she was strangled in the royal palace, and a servant named Fredegonda was summoned to share the honours of the throne of Chilperic. Brunehaut vowed to revenge the murder of her sister, and the fires of civil strife were at once lighted up throughout all Gaul. An army of barbarians gathered together beyond the Rhine by Sigebert, devastated without opposition the provinces of Neustria. Chilperic, on the other hand, entered the western defenceless provinces of Austrasia, and committed equal ravages. This fratricidal war, for its ferocity and barbarity, has scarcely a parallel in history. Chilperic and Fredegonda were at length shut up within the walls of Tournay, and Sigebert, borne on the shields of his victorous soldiers, was proclaimed monarch of the two kingdoms. His triumph, however, lasted only for a few months, for, when, after a tedious siege, Tournay was reduced to the last extremities, the hand of the assassin came to the aid of Fredegonda, and cut short the victorious career of Sigebert. It would be tedious to pursue in detail the atrocities that subsequently marked the varying vicissitudes of the rival parties. Suffice it to say that Fredegonda soon squandered away the treasures of Chilperic; his subjects were overwhelmed with taxes and vexations of every kind, to enable her to carry out her wicked designs ; at length, becoming wearied of Chilperic himself, she caused him to be assassinated, and had herself proclaimed regent of Neustria, in the name of her infant son Clothaire, who was only four months old. It was whilst Columban journeyed on, seeking a secluded spot for his future monastery, that the news of the murder of Sigebert was brought to him; he therefore passed the frontiers of Austrasia, and, entering the desert of Vosges, resolved to make it his home. Annegray was thus chosen for the first foundation under his monastic rule. The fame of the virtues, miracles, and penitential life of the Celtic strangers could not be long confined within the desert of Vosges. Thousands flocked thither from every part of Gaul, to receive the words of life, and many of the noblest Franks, flying from the violence and corruption of their respective courts, chose, as a greater good, the rigid rule of St. Columban. Annegray was soon too small for the crowds that sought to enrol themselves in its community. The ruins of another Roman castle or encampment named Luxeuil, situated at the foot of the hilly range of Vosges, on the confines of the kingdoms of Austrasia and Burgundy, and not far distant from Annegray, were chosen as the site of a second monastery, which soon became the spiritual metropolis of both kingdoms. A few years later, a third monastery was erected in the same district, at a spot, which, from its salubrious springs, was called Fontaines. Six hundred disciples of the great Irish missionary dwelt in these three monasteries, and in a short time that form of perpetual prayer known as laus perennis, was instituted, so that in unwearied succession, by night and day, throughout this vast solitude, the voices of the religious, like those of the angels, celebrated in unceasing psalmody the praises of God. In the desert of Vosges the true dignity of man was fearlessly proclaimed. Every rank and condition of life was represented in that army of God, and the serf and plebeian ranked equal with the prince and courtier, under the standard of St. Columban. Rich or poor, bond or free, learned or untutored, were taught 'to kneel before the same altar, and to pursue the same path of perfection. Thus the wealthy Romaric distributed his possessions to the poor, and, accompanied by a number of his own serfs, entered the monastery of Luxeuil. Here he gladly recognized his former slaves, not only as brethren, but as superiors, for he sought the lowest occupations in the monastery, and it was his delight, even whilst learning the psalter, to be engaged in some manual labour. And now it will not surprise us to find that St. Columban's mission awakened a new spirit of industry and labour throughout all Gaul. The religious of the monastery took part by turns in the tillage of the surrounding fields. In the lives of the great founder and his brother saints we see them employed at intervals in mowing, reaping, and cutting wood. Even the sick were obliged to work, and as a lighter task the thrashing of the corn was allotted to them. So much was this insisted on that St. Columban's monastic rule expressly enjoins that the religious should retire to rest so exhausted that sleep should overcome him on the way, and that he should rise again to labour before sleep had given full repose to his wearied limbs. " It is at the cost of this excessive and perpetual labour," writes Montalembert, " that the half of France and of ungrateful Europe has been restored to cultivation and industry." (p.405). The example of such works exercised a salutary influence upon the rustic population, and those who hitherto fled from toil now joyfully associated themselves in labour with the disciples of Columban. I may be allowed to give a few examples of the salutary influence thus exercised by the religious in the promotion of agriculture. A monk named Theodulf, descended from a long line of illustrious ancestors, was remarkable for his fervour, and for twenty-two years laboured almost incessantly at the plough. When, at length he was chosen abbot, and was, therefore, obliged to devote his attention to other cares, the people of the neighbouring village took his plough and hung it up as a relic in their church. It was, indeed, a relic, " a noble and holy relic of one of those lives of perpetual labour and superhuman virtue whose example has happily exercised a more fruitful and lasting influence than that of the proudest conquerors. It seems to me that we should all contemplate with emotion, if it still existed, that monk's plough, doubly sacred, by religion and by labour, by history and by virtue : for myself, I feel that I should kiss it as willingly as the sword of Charlemange or the pen of Bossuet"
Of another monk, named Ermenfried, who from the highest post in the Royal court had passed to the monastery of Luxeuil, it is recorded that on Sundays he distributed the eulogia, or blessed bread, to the inhabitants of the surrounding districts. Whenever he perceived the hard hands of the ploughman he stooped down and kissed with loving tenderness these noble marks of the week's toil : and whilst the descendants of the Frank conquerors thus, before the altar of Christ, kissed the rough hand of the Gaulish husbandman, it cannot surprise us that the deserts of Vosges should in a short time be peopled with devoted citizens, and be changed into that smiling garden which it has continued to be to our own days. The history of St. Waleric, whose harsh name has been softened down to the more classic and sweeter sound of Valery, presents to us, perhaps better than any other, a faithful picture of the laborious and fruitful life of the religious of Luxeuil. He was a shepherd boy of Auvergne. Seeing that the sons of the nobility flocked to the monastery for instruction, he too was fired with holy desire to share their lessons of heavenly wisdom. He cut his own tablets in the forest, and, with the help of some of the monks, the first difficulties of the alphabet and rudiments were overcome. In a short time, such was his proficiency, that, though he yet tended his father's flock, he had committed to memory the whole Psalter. Being at length admitted to the monastery, the care of the novices' garden was assigned to him. He laboured incessantly at this post, and a special blessing seemed to reward his toil, for no flowers were so fragrant as those which came from the lands of Valery. One day, whilst St. Columban was engaged in imparting his lessons of heavenly wisdom, Valery entered. The room was at once filled with a sweet perfume, and St. Columban being told who it was that bore with him this heavenly fragrance, said to him : "It is thou, my beloved gardener, who art the true abbot and lord of this monastery." Soon after Valery was sent by St. Columban to evangelize the country around Amiens, where many had relapsed into the vices of paganism. Miracles marked his ministry. At the same time, so austere was his life, that he drank no wine or beer. Barley-bread was his only food, and often times whole weeks were passed with only one repast. Before his death he founded the great monastery of Leuconaus, at the mouth of the Somme, where the high cliffs, bathed by the sea and pointing to the sky, served to admonish his religious of their true heavenly destiny. St. Valery suffered much persecution during his missionary career, but in after ages his memory was held in veneration, and the annalist records that the founders of two great dynasties, Hugh Capet and William the Conqueror, as well as the bravest of the English Kings, Richard Coeur-de-Lion, came to the shrine of this humble shepherd boy to pay the tribute of their homage. St. Columban could not expect that the enemy would allow him to enjoy perpetual peace in his religious home. Some disciplinary peculiarities of the Irish religion, in the form of their tonsure, and in the time of their celebration of Easter, gave occasion to his first conflict. When the Bishops of Gaul assembled to deliberate on the matter, Columban addressed a letter to them, which has happily been preserved, and which, in each line, reveals to us the devoted piety and glowing spirit of its writer. He begins by congratulating them on the interest which they now gave proof of in the cause of Holy Church, and he prays, that henceforth their synods may be more frequent, in order that all abuses may be the more effectually checked. He adds : " I am not the cause of the difference that exists in our observance. I have come into those parts a poor stranger for the cause of Christ, the Saviour, our common God and Lord. I ask of your Holinesses but a single favour : that you will permit me to live in silence in the depth of these forests, near the bones of seventeen brethren, who have already passed to their reward. I shall pray for you with those who remain to me, as I ought, and as I have always done for twelve years. Let us live with you in this Gaul where we now are, since we are destined to live with each other in heaven, if we are found worthy to enter there. Despite our lukewarmness we will follow, the best we can, the doctrines and precepts of our Lord and the Apostles. These are our weapons, our shield, and our glory. To remain faithful to them we have left our country and are come among you. It is yours, holy fathers, to decide what must be done with some poor veterans, some old pilgrims, and would it not be better to console than to disturb them. I dare not go to you for fear of entering into some contention with you, but I confess to you the secrets of my conscience, and how I firmly believe in the tradition of my own country, which is moreover the teaching of St. Jerome." And then, after a lengthened reasoning on the subjects under discussion, he concludes " God forbid, that we should delight our enemies, namely, the Jews, heretics, and pagans, by strife among Christians. . : . If God guides you to expel me from the desert, which I have sought here beyond the seas, I should only say with Jonas, ' Take me up and cast me forth into the sea, so that the sea may be calm' . . . Yet pray for us as we, despite our lowliness, pray for you. Regard us not as strangers to you, for all of us, whether Gauls, Britons, Irish, or others, are members of the same body. I pray you all, my holy and patient fathers and brethren, to pardon my talkativeness, and the boldness of one who is engaged in labour beyond his strength." This storm was scarcely hushed when a more eventful conflict awaited our great missionary, the first of the many conflicts, which, throughout the middle ages, were sustained by the cloister in defence of the purity of Christian morals. In the year 596 Brunehaut assumed the reins of power in the kingdoms of Austrasia and Burgundy, as regent in the names of their respective sovereigns, her grandsons, Theodobert and Thierry. The nobles of Austrasia, disgusted at her rule, soon caused Theodobert to expel her from that kingdom. Then Burgundy alone remained to her, and fearing a rival near the throne of Thierry she opposed his marriage, and caused him to plunge into the worst of vices. Even when he at length espoused a Visigoth princess, she caused him to repudiate her at the end of a year. One day when Columban was summoned to the royal mansion at Bourcheresse, Brunehaut presented to him the four sons of Thierry. " Why do you present these children to me?" asked Columban. " They are the sons of the king," replied Brunehaut, " strengthen them with thy blessing." " I cannot bless them," answered Columban ; "and these children of unlawful birth shall never wear their father's crown." Brunehaut was filled with rage, and from that moment vowed the destruction of the Columbian monasteries. Thierry, at her instigation, presented himself at the gates of Luxeuil, and having, without permission, entered the monastery with his followers, proclaimed that thenceforward its enclosure should cease, or the monks must lose the royal gifts. Columban, with his usual courage, replied to the king : "If you seek to violate our rules, we cannot accept your gifts ; and as you come here to destroy our monastery, know that your kingdom shall be destroyed with all your race." It was only in defence of the purity and dignity of Christian marriage that St. Columban waged this war against Brunehaut. In punishment for his intrepidity he was now expelled for the first time from Luxeuil, and conducted to Besancon, whilst a rigorous blockade was established around the monastery to prevent any communication of the religious with their spiritual Father. This was in the year 610. For a short time the saint remained unmoved in Besangon, surrounded by the respect of its people, who had long felt the benign influence of his virtues. One morning, as he ascended the rock on which the citadel now stands, and surveyed the road which leads to Luxeuil, his heart was filled with emotion, and, despite the royal mandate, he bent his steps towards his loved monastery. The momentary joy of his afflicted children was quickly succeeded by a more bitter separation, and after an abode of twenty years at Luxeuil, St. Columban was now forced by the soldiers of Thierry to quit its hallowed walls, and all the surviving Irish monks were commanded to depart with him. Led away a second time to Besangon, he was thence, with his companions, conducted by a military guard to Nevers : there they embarked upon the Loire, and passing by Orleans and Tours, were put on board an Irish ship in Nantes. The narrative of this journey across the very centre of Gaul was penned by an eye-witness, and presents many scenes full of the deepest interest. At Orleans he sent two of his followers to buy provisions, but the citizens were prohibited to hold any communication with him. A Syrian woman, however, presented herself. " I am a stranger like you," she said, " and I come from the distant East." She offered them hospitality, and in reward, her husband, who was blind, had his sight restored to him at the blessing of Columban. At Tours he begged to be permitted to pray at the tomb of the great St. Martin ; but his savage guards only replied by ordering the boatmen to redouble their speed whilst passing through this city. However, an invisible force stayed the boat ; Columban landed, and spent the night before the relics of. St. Martin. Next day he met one of the chief officers of Thierry, and filled with the spirit of prophecy, told him : "Say to thy friend, the king, that three years from this time he and his children shall be destroyed, and his whole race shall be rooted out by God. Arrived at Nantes, the thoughts of Columban were again turned to Luxeuil, and he penned a letter, which begins : " To his dearest sons, his 'dearest pupils, his abstemious brethren, to all the monks. Columban the Sinner." This letter is replete with the most tender affection for his loved disciples, and conveys admirable instructions for their future guidance. One of the religious named Waldolene had not been present at his departure from Luxeuil, and now our saint tells Attalus, with loving solicitude : " Always take care of Waldolene, if he is still with you ; may God grant him everything that is good ; give him, for me, the kiss of peace, which I could not give him myself." The letter concludes as follows : "While I write they come to tell me that the ship is ready, the ship which is to carry me back against my will to my country. . . The end of my parchment obliges me to finish my letter. Love is not orderly ; it is this that has made my letter so confused. I wished to abridge everything that I might say everything ; and yet I could not say all that I desired. Adieu, dear hearts ; pray for me that I may live to God." The vessel in which Columban embarked had scarcely set sail when it was driven back upon the coast of Gaul by a violent storm, and once more the saint, with his companions, was at liberty to pursue his missionary pilgrimage. They bent their steps to Soissons, where Columban repeated to the now reigning Clothaire the prophetic announcement that before three years the kingdoms of Austrasia and Burgundy would be added to his dominions. Continuing their journey, the holy pilgrims traversed the whole of the southern districts of Austrasia. As they passed through Paris, Meaux, and Champagne, many of the Frank nobility brought their children to receive the blessing of St. Columban, and we will see hereafter how copious were the fruits of holiness that were granted as their reward. Theodobert pressed our saint to remain in his kingdom; but another thought had now taken deep root in the soul of the fervent missionary. In his monastery of Luxeuil he had often pondered with sorrow on the sad gloom of paganism that hung over so many fertile countries beyond the Rhine, and it was now his fixed resolve to bear to these benighted regions the sacred light of the Gospel. Embarking upon the Rhine below Mayence, he pursued the course of that majestic river to the lake of Zurich. At Tuggan, where the river Limmat enters the lake, he founded a monastery, and remained for some time announcing the truths of faith to the pagan inhabitants of the surrounding country. Thence he passed to Bregentz, on the shores of Lake Constance, where the Alleman tribes still offered sacrifice to Woden. In an ancient church of St. Aurelia three golden statues were adored by these idolators. St. Columban fearlessly broke the idols to pieces, and cast the fragments into the lake. He then proceeded to purify the church ; and it is interesting to learn from the contemporary historians of his life, the ceremonies with which our Celtic missionary restored this sanctuary of St. Aurelia to the piety of the faithful. Causing water to be brought, he blessed it and sprinkled it around the church. He next chaunted psalms around the edifice, and hallowed its precincts. Then he consecrated the altar, and replaced in it the relics of St. Aurelia, and indescribable was the joy of the old inhabitants when once more within these hallowed walls they saw offered up the holy sacrifice of the Immaculate Lamb. In the monastery of Bregentz St. Columban renewed the fervent life of Luxeuil. He himself laboured in the fields, and fed the poor and the pilgrims with the produce of his labour. He also made nets for his dear companion St. Gall, and many were the miraculous draughts of fish which repaid his charitable desire to meet the wants of the poor. Still there were some of the idolators who ceased not to persecute him. They even murdered two of his companions. Then our saint shook the dust from his sandals, saying : " We found, indeed, a golden vase here, but serpents dwell within it. The God whom we serve wishes us to preach elsewhere." Hitherto the tribes of Gaul and the Pagan Suevi and Allemans had engaged the zeal of St. Columban. The far more ferocious race of the Lombards, half Pagan, half Arian, now awaited his ministry. Bidding, therefore, farewell to the cold hills of Switzerland, he bent his steps through the path of St. Gothard towards the fair plains of Italy, and in the very heart of the Lombard nation founded a new citadel of Christian faith, and a new centre of religious observance, at Bobbio. But whilst St. Columban thus enters on his new field of labour at the foot of the Apennines, and whilst mid-way between Genoa and Milan, on those banks of the Trebbia which were immortalized by the encampment of Hannibal, he traces the foundation of his future monastery, we must leave him for a while, and turn our thoughts to Gaul to consider the rich spiritual harvest which there repaid one hundred-fold his long years of missionary toil. Events in Gaul had marched onward with rapid pace since the departure of Columban. Theodobert and his children were first cut off by Thierry. Then the hand of God fell upon Thierry and all his race ; and before the close of the year 613, Clothaire saw all the kingdoms of Gaul united in his hands. Mindful of the prophecy of Columban, his first care was to summon an assembly of the bishops, and to send a deputation to our saint to invite him back to the former field of his labours. St. Columban did not comply with this request of Clothaire, but sent to him instructions for his future guidance, replete with the noblest maxims of heavenly wisdom. But though the holy abbot was thus absent, his mission in Gaul was now destined to attain a complete and glorious triumph. There was no diocese throughout France that did not eagerly seek a bishop from the Celtic monasteries of the Vosges ; and what shall I say of the zealous labours of these sons of St. Columban in restoring the vigour of ecclesiastical discipline, and in re-constructing the scattered sanctuaries of God throughout all Gaul. What shall I say, too, of the many religious communities that went forth from Luxeuil, like swarms from the parent hive, to bear to other regions the many blessings it had inherited from the Irish missionary. The whole of the rich district of Burgundy, situated on the banks of the Saone was the first to yield to the influence of the monasteries of St. Columban. Donatus, who had been long trained by our saint in the paths of piety, established a noble monastery in Besancon, which he dedicated to St. Paul, even as that of Luxeuil bore the name of the Apostle St. Peter. Subsequently, the same religious founded the great monastery of Jussamoutier for nuns, whilst his brother, through reverence for St. Columban, pro amore beati viri Columbani, re-constructed, on the southern side of the Jura, the religious institutions of Romain-moutier. Between the Saone and the Tille, to the east of the Velvet Forest, arose the abbey of Beze, whilst another famous monastery was erected on the banks of the Cusancin, under the care of Ermenfried. The same southern cluster of the Vosges was also hallowed by the sanctuary of Remiremont This hill still retained the temples, idols, and tombs of Pagan Rome, but soon, on account of the two great monasteries, and the seven chapels which adorned it, it was known throughout all Gaul as the Holy Mount. But this luxuriant vine was not yet exhausted; having rapidly spread through Burgundy, it soon filled Austrasia with its clusters, whilst on the other side it extended over Neustria, beyond the Loire, and as far as Aquitaine. What shall I say of the monastery of Solignac, founded by a monk of Luxeuil, St. Eligius : it gave birth to many other monasteries, and in after times was eulogized by the venerable Peter of Cluny, as the most fervent religious house of France. Four monasteries were founded in the district of Bourges, by another disciple of our saint named Theodulf. Then Moutier-la-Celle was founded at the gates of Troyes, where the marshy island on which it stood was soon changed to a smiling garden. What shall I say of Hautvilliers and Moutier-en-Der, and Centula, all of which afterwards attained high eminence in the Carlovingian era. But there is one religious of Luxeuil who merits special mention. Audomar, or Omer, possessed vast estates near the Lake of Constance, but surrendered all to embrace the rule of St. Columban. From Luxeuil he was chosen bishop of Therouanne, and to consolidate his work of piety, founded the great monastery of Sithiu. This holy house gave twenty-two saints to the calendar of the church, whilst the city which sprung up around the monastery, handed down to posterity the name of this great bishop of Therouanne. And here I would wish to mention the many families that showed hospitality to St. Columban in his pilgrimage through Austrasia, and which, fortified by his blessing, became centres of piety throughout that kingdom. On the banks of the Marne, he was joyously received by a Frank nobleman named Autharis. The blessing of the holy missionary was bestowed on the three sons of Autharis to repay this hospitality. All three, remarkable for their zeal and piety, became in after times the founders of great monasteries, and one of them, St. Ouen, was destined to attain special eminence as bishop of Rouen. Near Meaux, the family of Agnerric was specially enriched by heaven in reward for its devoted attachment to the exiled Columban. The little daughter of Agnerric, known to history under the name of Burgundofora, braved the terrors of martyrdom, that she might devote herself wholly to God. She founded the famous sanctuary of Faramoutier, which was for centuries the cherished retreat of the daughters of the Frank nobility. When the wicked Agrestin traduced St. Columban and his disciples, and sought to detach Burgundofora from the observance of the Celtic rule, he received from her the well-merited reproach: " I will have none of thy novelties; as for those whose detractor thou art, I know them, I know their virtues, I have received the doctrine of salvation from them, and I know that they have opened the gates of heaven to many." The brothers of Burgundofora vied with her in sanctity. Cagnoald having shared the perils of St. Columban's exile, laboured with him among the Allemans, and subsequently became bishop of Laon. Another brother, named Faro, attained the highest post in the army of Clothaire the Second, but exchanging the sword for the cross, became bishop of Meaux, in the midst of his paternal estates. It was his anxious care to honour the memory of his spiritual Father by founding hospices and monasteries for the pilgrim countrymen of Columban; and one of the pilgrim Scots whom he thus welcomed was St. Fursey, who, at the bidding of Faro, closed the fatigues of a long missionary life by becoming Abbot of Lagny-sur-Marne. Another of the pilgrims welcomed to his hospice was St. Fiacre, who transformed the wooded glades, given to him by the holy bishop of Meaux, into gardens, and devoted their produce to the poor : to our own days this great Irish pilgrim is venerated as the patron of gardeners throughout all France. Thus the mission of our saint, as apostle, as spiritual legislator, as avenger of public order, and restorer of social life, achieved complete success in Gaul ; and it is a striking fact, which should never be forgotten in the history of the country thus specially fostered by the blessing of Columban, and thus quickened by his religious spirit into the full vigour of social life, that, before one hundred years from the death of the great Celtic pilgrim, it was precisely with this kingdom of Austrasia, under Charles Martel, were linked the hopes and destinies, not of France alone, but of all Europe and of Christendom. But whilst commemorating the happy results of St. Columban's labours we must not omit to mention the special fruit of those who accompanied him from Ireland in his holy enterprise. Among his companions there was one named Dichuill, whose name gradually assumed, on the Continent, the forms of Deicolus and Desle. When the Irish monks took their departure from Luxeuil, his strength failed him on the road to Besancon. Unable to continue his journey, he entered the adjoining forest; here he met a swineherd, who at first fled from him, terrified at his great stature and strange costume, but subsequently pointed out to him a habitable spot, where he erected his cell. This forest was a favourite hunting-ground of King Clothaire; and one day a wild boar, pursued by the royal party, took refuge in the cell at the feet of St. Dichuill. Its life was spared through reverence for the holy solitary; and disciples, attracted by the fame of this event, soon flocked to him for counsel. This cell became one of the richest monasteries in Christendom; the town of Lure grew up around it, and its abbot, in later ages, was reckoned among the princes of the Roman Empire. The picturesque town of St. Ursanne, in the Swiss Canton of Bale, owes its name to Ursicinus another Irish companion of St. Columban. He chose for his cell the banks of a deep and narrow gorge hollowed by the river Doubs, in the very heart of the Jura range, not far from the coast of Lake Bienne. He made it his special care to erect an hospice for the sick poor and the wearied travellers who sought a path over these rugged mountains. It was the privilege of his monastery to give to heaven the two first martyrs of justice and charity who adorned the Order of St. Columban. One of the Celtic missionaries named Sigisbert accompanied our great abbot through all his pilgrimages, even to the foot of Mount St. Gothard, but obtained permission there to choose for himself a silent retreat in the bosom of the highest Alps. Crossing the glaciers and peaks of Crispalt he penetrated to the sources of the Rhine, and erected his cell in a solitary spot which was watered by a clear streamlet. At his preaching the pagans of the surrounding forests soon felled their sacred oaks, and in the midst of that vast wilderness a noble monastery sprung up, which still subsists and gives name to the town of Dissentis. Thus by our Celtic missioners was won and sanctified, from its very source, that Rhine whose waters in after times were to bathe so many illustrious monastic sanctuaries. But the glory of all these holy men was far surpassed by the fame of St. Caillech, better known by his latinized name of Gallus. He was nephew of our national patron St. Brigid, and a near relative of St. Columban. He accompanied our great abbot as far as Bregentz, where he devoted himself to preach to the Allemanni tribes of Switzerland. When St. Columban resolved on journeying on to Italy, St. Gall fixed his retreat among his favourite barbarians, not far from the spot where the Rhine falls into Lake Constance. He was walking on," says his biographer, " praying that God might mark out for him some chosen spot for his abode, when he stumbled over some broken brushwood and fell to the ground." St. Gall at once entoned the verse of the Psalmist : " This is my chosen habitation ; this is my resting-place for ever." Here he built his cell, and in front of it he arranged two hazel boughs into the form of a cross, to which he attached the case of relics which he carried round his neck. When St. Gall closed his days, on the 16th of October, 646, "the entire country of the Allemanns had become a Christian province, and around his cell were already collected the rudiments of the great monastery which, under the same name of St. Gall, was to become one of the most celebrated schools of Christendom, and one of the principal centres of intellectual life in the Germanic world." And here allow me to call your attention to the close bonds of spiritual brotherhood which united together these Celtic foundations of the companions of St. Columban. Of St. Gall it is recorded that he sent one of his religious to Bobbio to make enquiries about his great master. The messenger brought back with him the cambatta or crozier of St. Columban, which the dying abbot had bequeathed to his loved disciple. Ten years later a deputation from Luxeuil, composed of six Irish monks, waited on St. Gall in his mountain retreat. They came in the name of the whole community to pray him to undertake the government of that great monastery, which was now vacant by the death of St. Eustasius. St. Gall, indeed, refused this honourable post, saying that he chose to await his resurrection in the sanctuary which God had given him for his inheritance ; but these events of his life sufficiently prove how close was the spiritual friendship that subsisted between the Celtic monasteries of Italy, Switzerland, and Gaul. The lives of the monks of the Columban monasteries abound with similar examples. Thus we read of the rich Count Vandregisil, who, from praying at the tomb of St Ursicinus, passed to the cloister of the adjoining monastery, and revived on the frontiers of Switzerland all the rigours and austerities of the Celtic saints, that through devotion to St. Columban he made a pilgrimage across the Alps to Bobbio ; and being filled with admiration for the virtues of the fervent religious of that monastery, he set out anew on a pilgrimage to Ireland itself, to learn at the parent source the highest maxims of perfection. This noble pilgrim having thus renewed the bonds of the monasteries of Switzerland and Italy with Ireland, returned to Gaul and founded the great abbey of Fontenelle, which was destined to fill an important place in the ecclesiastical history of Normandy. It is a curious fact that this Columban monk was the first to plant the vine in Normandy. The ruined towers of Jumieges still testify to the traveller on the Seine the magnificence of another monastery, whose founder, Philibert, emulated the virtues of St. Vandregisil. His first pilgrimage was to Luxeuil ; thence he journeyed on to Bobbio, to pray before the shrine of his spiritual father ; and from Bobbio he pursued his course, seeking new sources of edification at each of the branch monasteries that had sprung from the same parent stock. His own great abbey of Jumieges became a favourite resort for vessels from the Irish coast, and it is further recorded that the holy founder erected in his church three altars one under the invocation of the holy Mother of God, another of St. John, the third of St. Columban. And now, following in the footsteps of these venerable pilgrims, we too may pass" in spirit to the rich plains of North Italy to see the golden fruit that crowned the closing years of our great missionary. In the same year in which St. Gregory the Great ascended the throne of St. Peter, the Catholic Theodolinda, of Bavarian origin, espoused the Lombard King Agilulf. Yet, did not the Lombards cease to pursue their reckless course of devastation. " This nation," says St. Gregory, " issued from its native deserts, as the sword is drawn forth from its scabbard, to mow down the human race." The ravages of Agilulf extended even to the gates of Rome, and the city itself was indebted for its safety to the vigilance of Pope Gregory. " On every side," writes this great Pontiff, " there is nought but desolation. Agilulf destroys the cities, changes the towns into a heap of ruins, depopulates the plains, and makes whole provinces one vast solitude. Many arrive in Rome with their hands amputated ; others are led away into captivity, and on every side, there is nought but the torture of unhappy victims and the image of death." And subsequently he wrote to the Emperor Mauritius : "I was obliged to see with my own eyes the Romans led away into Gaul with ropes around their necks, like dogs, to be sold in the market-place." There are indeed many features of this Lombard ferocity, which we have seen renewed in the north of Italy in our own times. The monasteries of the holy virgins of Christ were everywhere a special object of their rage, and a countless number of nuns was forced to seek a refuge and a home in Rome. When a little later, Agilulf was baffled in his attack upon the city, Pope Gregory again wrote : " To the prayers, and tears, and fasts of these exiled nuns, Rome owes its deliverance from the swords of the Lombards." The result of St. Columban's mission among these barbarians may be told in a few words: Theodolinda had, from her infancy, known his fame of sanctity, and thus the way was opened to him to approach the court of Agilulf. By the zeal of our saint, combined with the efforts of St. Secundus, bishop of Trent, the Lombard king at last yielded to grace, and when the heir of his throne received the regenerating waters of baptism, these two holy men acted as sponsors, and, in his name, promised fealty to the Catholic Church. On that day a new nation was gathered to the fold of Christ, and a new era of social life dawned upon afflicted Italy. At the urgent request of Agilulf, St. Columban, though now weighed down by years, wrote a learned treatise against the Arian heresy, with which a portion of the Lombard nation had been infected. It required the sword of the Saracens to root out Arianism from Spain ; but the zeal of the monks of Bobbio and the pen of St. Columban banished it for ever from the plains of Italy. Another task which our saint assumed, by order of the Lombard king, was to write a long letter to the then reigning Pontiff, St. Boniface the Fourth,, on the question of the " Three Chapters." The controversy on this subject had raged with special violence on the eastern coast of the Adriatic, whither the sway of Agilulf now extended. It had hitherto, however, but little engaged the thoughts of Columban, and he knew but little of its details, as he repeatedly avows. Yet, on the whole, his letter may be justly styled one of the noblest apologetic treatises which have come down to us from the seventh century. The enemies of our holy Church at the present day refer to it indeed as a proof of the hostility of. St Columban to the See of Rome. But surely that writer does not deny the authority of the Roman Pontiff, who calls upon the Pope to cut off heresy from the fold of Christ; he does not deny the privileges of the successors of St. Peter, who declares that they were divinely constituted to guide the helm of the mystic ark of God ; he is not the enemy of the Vicar of Christ, who lovingly addresses him as " his loved Master, his spiritual Pilot, the Pastor of Pastors, the most honoured Head of all the Churches," and yet such are the epithets repeatedly made use of in this letter of St. Columban. You will permit me to add one passage from this beautiful letter, which should be engraven on the heart of every Irishman, and which, till the end of time, will remain a monument of the piety and faith of our Celtic Church : "We, Irish, who inhabit the extremities of the world," he thus writes, "are the disciples of St. Peter and St. Paul, and the other Apostles, inspired by the Holy Ghost. We receive no doctrine save that which is apostolical and divine. There has never been a heretic, a Jew, or a schismatic among us. But those whom I see around me, and who bear the burden of many heretics, are disturbed like a frightened flock. Pardon me then, if sailing here amidst many rocks, I have used any words displeasing to you. The native liberty of my race has given me that boldness. . . . We are bound to the chair of St. Peter ; for, however great and glorious Rome may be, it is this chair which makes her great and glorious among us. Although the name of your ancient city, the glory of Ausonia, has been spread throughout the world as something supremely august by the admiration of nations, yet to us you are only august and great since the Incarnation of the Redeemer; since the Spirit of God has breathed upon us, and since the Son of God, in his chariot, drawn by these two ardent coursers of God, Peter and Paul, has crossed the oceans of nations to come to us. Nay more, because of these two Apostles of Christ, you are almost celestial, and Rome is the head of the Churches of the whole world, excepting only the special privilege of the spot of the divine Resurrection." Never was the supremacy of Rome, and the unswerving attachment of our nation to the See of the Vicar of Christ, expressed in words of more fervent and devoted eulogy. I have said nothing of the special benefits conferred on literature and science by the mission of St. Columban, and now, at the close of my lecture, only a few words can be added on that subject. The name of Bobbio shall never be forgotten in the annals of literature. During ages of darkness and storm it was the treasury of learning, as it was the central abode of piety in North Italy; and if the most precious fruits of the classic genius of Rome and Greece have been preserved to our times, to say nothing of the golden works of the Fathers, we are indebted for them, in great part, to the toil and skill of the monks of Bobbio. Luxueil produced the same fruits of literature in Gaul. "Luxueil," writes Montalembert, "was the most celebrated school of Christendom during the seventh century, and the most frequented. The monks and clerics of other monasteries, and more numerous still, the children of the noblest Frank and Burgundian races, crowded to it. Lyons, Autun, Langres, and Strasbourg, the most famous cities of Gaul, sent their youth thither. The fathers came to study with their children ; some aspiring to the honour of counting themselves one day among the sons of Columban ; others to re-enter into secular life, with the credit of having drawn their knowledge of divine and human science from so famous a seat of learning. As it always happens, when a great centre of Christian virtues is found in the world, light and life shines forth from it, and brighten all around with irresistible energy." Amongst those who flocked to its halls was Conon, abbot of the famous monastery of Lerins. That great school in which our own apostle, St. Patrick, had drunk in the teachings of heavenly truth, had long since begun to be subject to a gradual decay, and now its representative comes forth from its cloister to seek at the hands of the Irish pilgrim strength and light to renew its former glory. What shall I say of the monastery of St. Gall, which attained an equally high fame for its learning and its sanctity among the Germanic nations? When Charlemange visited that monastery the deacon chaunted the versicle ; " Istud sanctorum concludit millia templum." 'Countless are the saints enshrined within these walls.' People in search of learning and piety flocked to it from all parts of Europe, rich and poor, nobles as well as plebeians, and so populous did it become that the honours of an imperial city were awarded to it. One of its own pupils was able to write of it in the tenth century : " Inde fons infertur sapientiae per cunctas totius Europae provincias derivatus, omnibusque hucusque, Dei nutu, suavissimo se potabilem dulcorabat gustu." This school of St. Gall was, in a special manner, famed for the cultivation of poetry and music: and even in subsequent ages we meet with some pilgrims from Ireland, who, having gone thither through reverence for its Celtic founder, were detained there to teach these branches to the German youths. And yet, if we may credit contemporary writers, it was no easy task to awaken the genius of harmony among the Allemans of those days. It is a writer of the ninth century that thus describes the special difficulties which beset the Allemans in the study of music : "Alpina siquidem corpora vocum suarum tonitruis altisone perrepentia, susceptae modulationis dulcedinem, proprie non resultant : quia bibuli gutturis barbara levitas, dum in flexionibus et repercussionibus mitem nititur edere cantilenam, naturali quodam fragore, quasi plaustra per gradus confuse sonatia rigidas voces jactat". Such were the rough Allemans in whom the sense of melody had to be awakened by the Celtic masters of St. Gall. If long ago that nation has overcome the harshness of its original jargon, and has attained high eminence in the science of music, it should never be unmindful of those who first taught its sons to entune the harp and excited in them an ardour for the enchanting strains of harmony. I have thus endeavoured to briefly sketch for you a few of the blissful results which were attained by the missionary enterprise of St. Columban and his associates. The memory of these great Celtic pilgrims has never ceased to be held in benediction by those countries which derived such blessings from their toil, and their names, though too often forgotten in the land of their birth, are encircled with glory in the pages of the continental historians. Thus Baronius writes : " St. Columban came like another Elias to re-kindle the flame of piety and learning in Gaul and Italy." And Ordericus Vitalis says : "This father of admirable sanctity, Columban, was most remarkable for his zeal. He was effulgent with glory among nations, by his miracles and prodigies, and, inspired by God, composed a religious rule which, for the first, he gave to Gaul. Most renowned monks came forth from his school, who, like the stars in the firmament, adorned the world by the brilliancy of their virtues." Ireland has at various epochs of her history received many blessings from the continent of Europe, and her Celtic heart never forgets such favours. Gaul gave to us one of its most illustrious sons, St. Patrick, for our Apostle. Ireland repaid the gift in St. Columban. of the hosts of Bassus below the clouds. 20. Escon with Froechán, i.e. Bó-chluain in Leix in the west of Leinster. Or bishop Froechan would be proper there, ut alii putant, a little east of Clúain eidnech. Idea dicitur Esconn 'impure,' because for thirty years he was unbaptized. In this immediate neighbourhood, but within the parish of Ballyfin, is Buchlone, a place with which is connected one, if not two, of our early Irish saints. In referring to this place in chapter on Ballyfin, the following curious extract was omitted: it is from the Feilire of Aengus, at 20 Nov:- "Beseech Esconn and Froechan, before strong (Slieve) Bloom." To which the gloss in Leab. Breac adds: "i.e. pray Bishop Fraecan in Bochluain in Leix, to the east of Cluain Eidnech, or (it is) episcop Froechan that is here ut alii putant, escon, i.e. thirty years was he without baptism et ideo dicitur scon, impure, sed non verum. But Guid episcop Fraechain (is the true reading), i.e. Froechan was his name, and a bishop was he, and in Bochluain he is, i.e. in Leix, and in Druim Daganda in Dalaradia. He is called Escon, because he slew a King of Leinster, i.e. by the dipping with his staff which he made at him while he (the saint) was at Bo-chluain and the king in a bathing-tub at Naas, i.esca ideo dicitur quia aquam baptismatis infudit." Dr. Whitley Stokes remarks in a note, that the meaning of this last passage obviously is that esconn is a vessel used for distributing water, and that the saint was so called because he baptized many. So it would appear that we are commemorating just one saint, Bishop Froechán of Buchlone, County Laois, who was given the name 'esconn' perhaps because of a connection to a baptismal vessel. He would also appear to have a northern connection as he is linked to a place in Dalariada. Almost forgotten at present, but yet situated near the old coachroad between Maryborough and Mountrath, is the former burial-ground of Bocluain. It is surrounded by high hedgerows of hawthorn, with some larger trees of that species now shading the grass-grown graves, and several rude headstones there, are now scarcely visible; yet, in former times, some kind of a church must have been erected on this site. In our Calendars, a St. Fraechan, Bishop of Bochluain, to the east of Clonenagh, in Laoighis, seems to have been venerated on the 20th day of November. The period when he flourished is not known to the writer; but it must have been during or before the eighth century; for he IS mentioned in the "Feilire" of St. Oengus, at the same date, and assigned to the same place. A scholiast on this passage states, that besides Bochluain in Leix, he was also venerated in Druim Daganda in Dalaradia. According to one tradition, he came from the north, accompanied by a saint called Escon. Others think the latter term is a corruption of the text, and that Epscop should be read, which should simply imply Bishop Froechan. His place is described as having been right before Sliabh Bladhma, now the Slieve Bloom Mountains. The etymon Bo-Chluain, in Irish, has been translated "the Cow's Lawn" or "Meadow." The spot here referred to lies about two miles south-west from Maryborough. Rev. John O'Hanlon, History of the Queen's County, Volume 1 (Dublin, 1907), 215. Canon O'Hanlon's suggestion that this troublesome word 'escon' might be nothing more than a textual corruption of the word 'epscop' (bishop) would solve this conundrum but whether it is correct I am not sure. We can at least be sure, however that a Bishop Froechán was commemorated on 20 November at this place.